Open Mesh makes it easy to deploy professional, secure wireless networks at a fraction of the time and cost of traditional networks. Open Mesh access points and enclosures are designed to work seamlessly together. Just choose the access point that is optimized for your wireless demands—range, speed, or lowest cost—then choose the enclosure that best fits your environment. Transform any access point into a traditional ceiling mount, a sleek outdoor unit, or an Ethernet wall-mount with pass-through ports. Swap, upgrade, move and replace anytime. What used to live in dedicated on-site servers can now be managed centrally through the cloud and the free CloudTrax web and mobile apps. 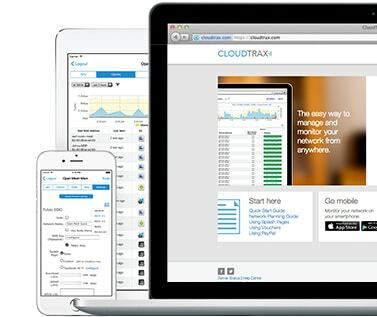 Whether you are deploying a single access point or thousands across multiple sites, CloudTrax is powerful enough to meet the demands of IT professionals while easy enough for someone with little network experience. And the price? It’s free: every piece of Open Mesh hardware includes a perpetual CloudTrax license. 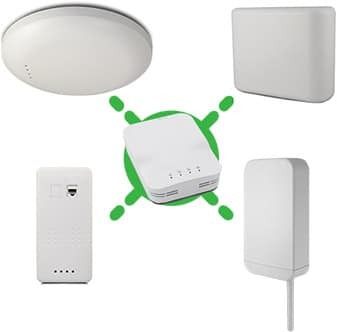 Every Open Mesh access point is automatically mesh enabled. 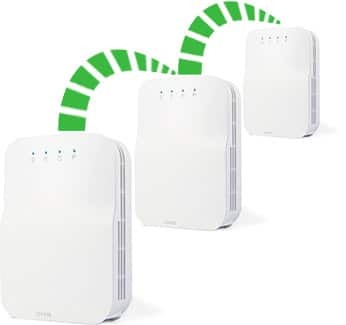 That means you can install units like traditional access points, hardwired to the Internet, and add additional units that only require power wherever you need to extend coverage or fill holes. All access points work together to form a self-organizing, self-healing wireless network with seamless roaming between devices. Extend your network to the furthest reaches of your property cable-free. Dead spots don’t stand a chance. 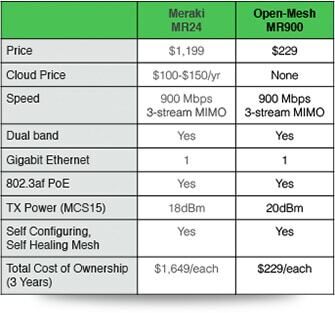 Open Mesh hardware is a fraction of the cost of other low-cost, cloud-managed mesh wireless solutions. With hardware designed from the ground up to fit even the tightest budget, along with a cloud controller that’s completely free, Open Mesh is the obvious choice for cost-sensitive deployments. But don’t let the low price fool you: Open Mesh meets or exceeds the performance of other solutions costing ten times more. With access points starting at just $55, Open Mesh proves how easy and affordable cloud-managed wireless networking can be. Open Mesh is ideal for systems integrators, resellers and IT consultants because we don’t put any logos on our boxes or access points. Even our cloud controller contains no links or references back to Open Mesh. With no competing messages, your brand is the star of the show. Open Mesh makes it easy to get wireless coverage exactly where you need it. 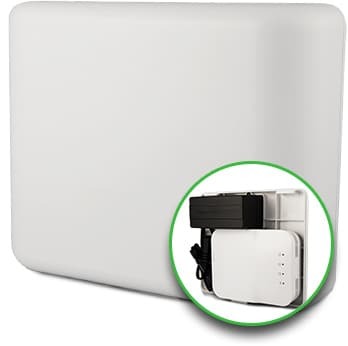 With a series of easy to use enclosures, you can put your access points on a wall, a ceiling, a pole, a roof, a tree…well, you get the idea. Open Mesh single band enclosures are designed specifically for the tiny, powerful OM Series access points and blend in seamlessly in any office, hotel, warehouse or apartment block. You see the wireless network; not the access point. Open Mesh OM Series access points support 12-24v passive PoE so the same cable that feeds your access point data can also provide power. With the use of a single-port, an eight-port, or a twelve-port rackmount passive PoE injector, you can power your access points up to 350 feet away. Need to use a PoE switch? There’s a model for that too. Open Mesh also provides a full range of power supplies that work in virtually every country around the world. Powering your network has never been easier. 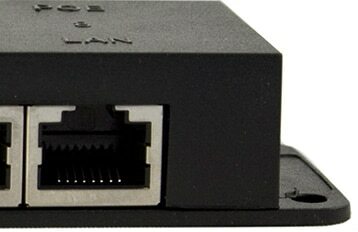 Note: The OM2P model is not 802.3af PoE compatible. The OM2P-HS is. Hardware is only half the story. With Open Mesh’s free cloud controller, CloudTrax, you can filter and prioritize traffic, set up multiple SSIDs, brand your own captive portal, charge for access and much more. All from your laptop, tablet or smartphone.